St. Teresa of Avila received profound spiritual direction on prayer from another, lesser known saint: St. Peter of Alcantara. 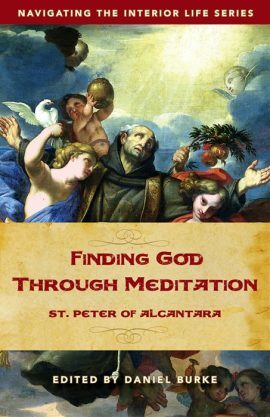 Now, all students of prayer can benefit from St. Peter’s answers to difficult questions on spirituality in Finding God Through Meditation. Learn from a forgotten master the pathway to intimacy with God. Finding God Through Meditation is the second book of Dan Burke’s Navigating series, which brings the wisdom of the saints into your hands. Through the spiritual writings of some of the Church’s masters of prayer, this series invites Catholics to deeper union with Jesus Christ. Dan Burke’s Navigating series brings the wisdom of the saints into your hands. This series is a goldmine for Catholics desiring to deepen their relationship with God and to grow into more intimate union with Jesus Christ. Be the first to review “Finding God Through Meditation: St. Peter of Alcantara” Click here to cancel reply.